When I played Star Ocean: First Departure earlier this year, I came away disappointed. I was looking forward to an epic sci-fi JRPG and instead encountered a brief fantasy tale wrapped in a sci-fi veneer. My eagerness to bask in the series wasn’t washed away however and I promptly began the follow-up Star Ocean: Second Evolution. 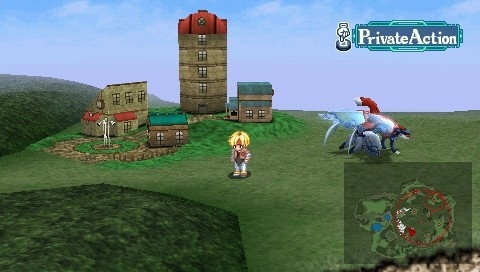 Another remake for the PSP, this one was of Star Ocean: The Second Story which originally released on the PlayStation in North America in 1999. This version was released ten years later and left me with many of the same grievances, but I wound up enjoying it more. Much everything remained the same from the previous remake. 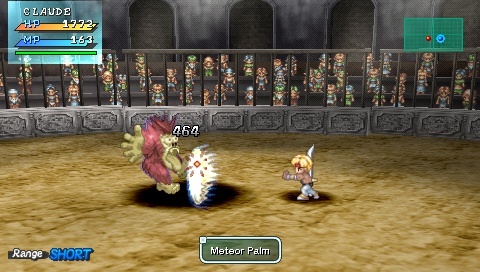 Of the Star Ocean games released to date, this is the only one to serve as a direct sequel to another. 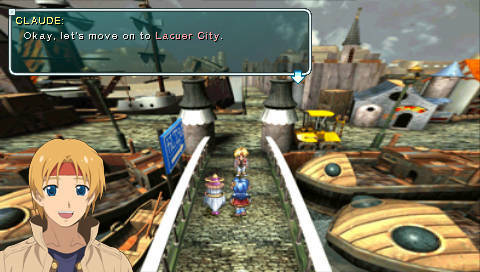 Set twenty years after the events of First Departure, this game is primarily the tale of Claude Kenny, the son of one of the original protagonists. I say primarily because players can also choose Rena Lanford as the centerpiece of the game. Both characters embark on a journey of self-discovery and their paths cross very early on at which point they remain together through the end. Having done a single playthrough I can’t comment on the differences caused by picking the other, but since they join up so early on, I can’t imagine there’s much uniqueness. Pretty quickly after starting, Claude gets separated from his father’s Federation crew and he’s left to fend for himself on a technologically inferior planet. Here he comes across Rena and the two eventually embark on a quest to rid planet Expel of the monsters that have freshly infested it. As their quest unfolds they meet likeminded individuals who join up as comrades. Like the previous game, this is a game meant to be replayed as all party members aren’t obtainable in a single playthrough. Unfortunately, tri-Ace pulled the same stunt of developing a fantasy JRPG in the veneer of a sci-fi setting – translated, the sci-fi aspects bookend fantasy elements comprising the bulk of the experience. I’m fine with either setting, but I would caution any readers planning to dive in – these first two games aren’t entirely sci-fi tales! Private Actions returned again but I made little use of them. The sci-fi elements on display were more pronounced however, with the final third taking place on another, further advanced planet. Energy Nede as it was called had an interesting backstory and was home to the Ten Wise Men. This group served as the eventual antagonistic force and they are one of the most memorable I’ve seen in a JRPG. They weren’t particularly fleshed out, but each one was unique and the progression in battling them made the conclusion an event. A few in particular were downright dastardly and evoked major tantrums in me. When they were felled, it was a satisfying event and ultimately everything ended on a cheerful note. Battles and exploration were identical to First Departure, down to the UI. These remakes were developed at the same time and accordingly, it was all very familiar to me. I still relied upon spamming the basic attack and this continued to be a decent strategy. I will say there were more enemies that required me to flank and others that I had to earnestly avoid attacks, so the battles were a little less monotonous than I’d previously experienced. The skill system returned too and I, again, really enjoyed spending the accrued skill points increasing individual character’s stats and skills. It was an addictive facet that that had a noticeable impact on my party’s performance in battle, making it all the more incentivizing. There were attractions and other diversions that I also didn’t invest myself in. Visually, I found this game very appealing. It was originally made during the era of prerendered backgrounds and they were left intact for this remake. Games aren’t often made with this style of prerendered backgrounds anymore as the horsepower in our consoles and computers no longer calls for it. The buildings and towns were constructed using this graphical style and they look dated, which sounds offensive; I really liked them so I would say they looked… nostalgic. Because this style is still new to me, I was able to give some things a pass, like the poor scaling. Some backgrounds were portrayed with such depth, that as I navigated Claude he would continue to shrink until I could barely make him out. Frequently, this made locating objects to interact with a bit of a chore. Part of the blame lies with the viewing area of the PSP’s screen. This was a console game originally so naturally it was meant to be played on a larger viewing receptacle. It wasn’t until I plugged my PSP into the TV and blew the image up that the visuals really looked right. The game was entirely playable on the PSP, and I usually prefer my RPGs in this form (apt for bedtime sessions), but the game’s roots begged for it to be played on the TV. Those prerendered backgrounds were begging to be seen on a TV! 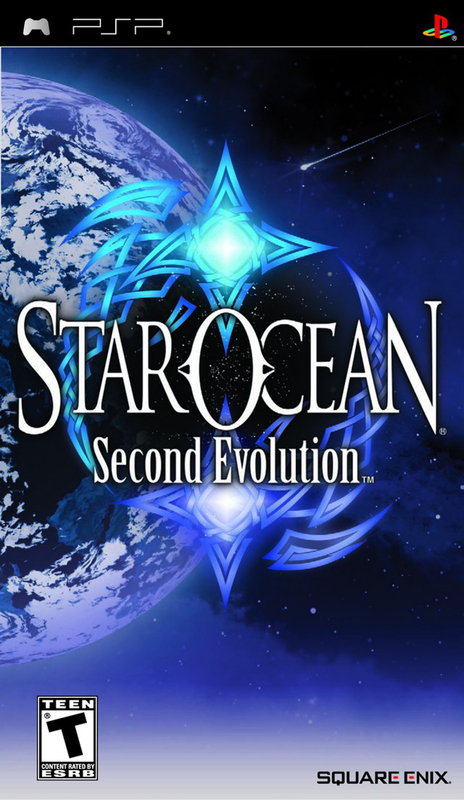 Star Ocean: Second Evolution was a more enjoyable game than its predecessor. The story was largely forgettable (what even happened in the middle, I couldn’t tell you) but it did have a larger concentration of sci-fi elements. As was the case with First Departure, it was when the narrative placed the characters in a futuristic setting that my attention was grabbed (especially when the Ten Wise Men were in play). But, it still felt like a fantasy JRPG wrapped in a sci-fi shell. 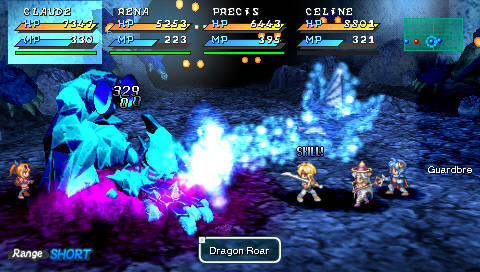 The core gameplay mechanics– battling and adventuring – were identical to the previous game; they still remained fun after another twenty hours due to the additional challenge breaking up the monotony. And graphically the game was presented in a way that felt fresh to me, despite the dated stylings. It’s the best Star Ocean I’ve played to date, but much of it was largely forgettable and perhaps not worth seeking out. A better future was found, but here’s hoping for an even brighter one.